I have been dying to share my latest thrift-store purchase with you – I was so excited when I found these polka dot high-waisted shorts! They did require a little bit of tailoring, which I had no problem paying for since they cost me less than $5. 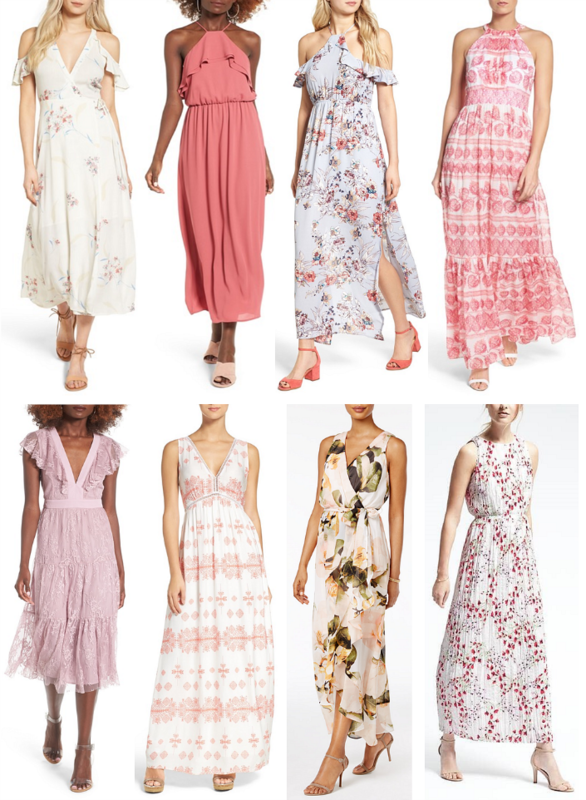 They aren’t organza, but the style reminded me so much of this J. Crew version, which I loved but wasn’t within my budget. I don’t own very many pairs of shorts & I like that these can be dressed up easily…plus, they will be great for print mixing with striped pieces (like this blouse). LOVE the shorts! and the blazer…and the clutch. ha ha! i haven't been estate sale-ing in a long time and i'm SO itching to go again soon! I have similar polka dot shorts and they're so comfy. Those shorts are too cute! Jealous. I can't believe you found those at a resale shop. Wow what a great find! 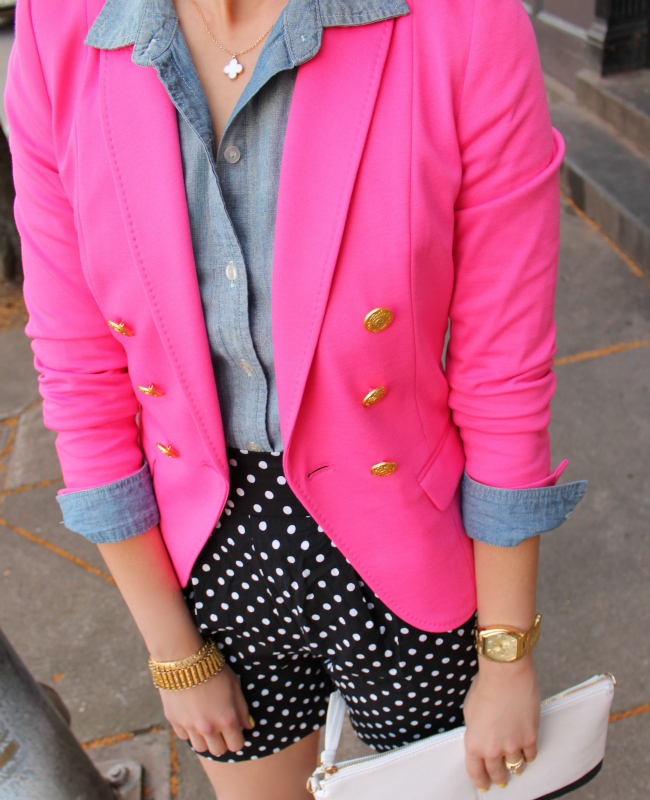 This is a very cute outfit, especially love the bright pink blazer. I'm having a you choose cashmere giveaway on my blog, I know you'll love it please pass by and enter! So cute! I love that thrifty find! Love how you have mixed textures, the denim shirt and blazer look fab! LOVE this outfit! your shorts are too cute! Pretty outfit! Love the colours and texures and that cute polka dot pattern! These shorts are a fabulous find and so versatile. Can't believe they were only $5!! Love how you paired them with the pink and chambray. Those shorts are the cutest! Love them with the chambray and pink blazer! What an awesome thrift find! You styled it beautifully! You look great. What a find! What an awesome find! They look fantastic on you! Love that pretty pink blazer! I love the pink with the polka dots! I've been looking for the perfect pink blazer but haven't found it yet. Love this! Love the thrifted shorts!! And the shirt. And the blazer. Super cute outfit! What a great outfit! I checked out JewelIQ and they're great! Will definitely be buying from them soon! LOVE this and what a steal! Adore it with the blazer, and that necklace? Reminds me of a van clef and arpels. Gorgeous! I love this combo! The shorts and blazer are a great mix! LOVE this entire outfit! Such a great combination! Love this outfit! And what a great find. Really amazing how you paired it together. What a great find. Love all outfit- so cute! 1. Silly but true, there is one piece of clothing that I always wished I had actually bought, but didn't and now it's forever gone. It' your fabulous army vest from Old Navy! I know, nothing super fancy but I swoon every time I see someone with it on and my heart breaks a little bit. "Why didn't I buy you when I had the chance?!?!?" 2. I'm obsessed with Emily the bachelorette. I think she is adorable and so stink in' cute with her southern accent. Why didn't I grow up in the south? 3. I'm blogging in my pi's…and it's gonna be 10am before I get out of them. I know, lazy but I love it! Very nice outfit,so chic! How come I can neverfind something cute like that at consignment/thrift shop?! Ahh! I've been wanting some polka dot shorts! They are super cute. Looking forward to seeing how you wear them with other pieces. i love polka dots on anything and these shorts are especially cute! You're wearing shorts and you look amazing!! Love these shorts- I'm a tad jealous as I've been looking for a pair of polka dotted shorts for a while now. Love these photos and the pop of color with that pink blazer just is stunning! Adorably styled look and the shorts were obviously a score and smart move with the tailoring they fit you perfectly and look expensive and high quality. You look fantastic! I love this look. Congrats on the thrifted find. I love these shorts! Gorgeous!!! Those shorts are a great find! Great thrifting find!! You make them look so expensive! this is gorgeous and i'm totally inspired. i want to find something similarly bright and fresh in my closet! I love this whole outfit! So girly and fun, especially with the bright pink blazer and the polka dots. Love that you thrifted the shorts too, they look fabulous and have more character than the J.Crew version! these shorts are so cute! Love that you got creative and altered them. Love the pink blazer. I have the navy version and LOVE it…looks a million bucks but so affordable. 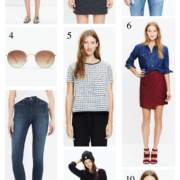 I totally thought these WERE the J.Crew shorts at first… great find! You are gorgeous in pink + navy! Wow – I absolutely adore the pink jacket! Can't believe it's from H&M, I will definitely be going there soon to look for it. This is a fantastic outfit and looks stunning on you. I love these polka dot shorts! Such a great vintage find 🙂 And paired with that pink blazer, gorgeous! I have worn my polka dot pj shorts out before and just featured them on my blog with pink pumps! Seriously miss – this is so stinking cute! Black, white and pink are my absolute favs! This look is so fun. AWESOME blazer, btw! Such a great find! Super cute look! Love your blazer! Such cute shorts! What an awesome find. And I love that blazer. My H&M didn't have that one! Sad. I'm WAY overdue for thrift store shopping! I do it in waves and I'm in the 'avoid thrifting' phase right now. These shorts are a great find! I love you paired them! So cute! That pink is a great color on you! I looove this color ensembles! Nice outfit!